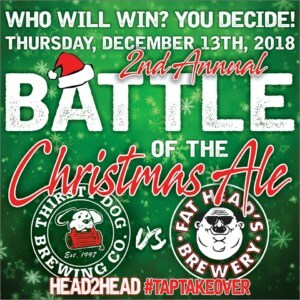 Battle of the Christmas Ales | Thirsty Dog Brewing Co.
It’s on, mark your calendars! The 2nd Annual Battle of the Christmas Ale is officially scheduled for Thursday, December 13th! The reigning champs,Thirsty Dog Brewing Co. and their 12 Dogs of Christmas take on the challenger, Fat Head’s Brewery and their Holly Jolly! Who will win? You decide! We will have incredible specials all night long while both breweries will be present and ready to BRIBE YOU FOR YOUR VOTE! We will be giving out gift cards and t-shirts along with additional prizes throughout the night! Cleveland.com will be here live-streaming the event, it’s going to be spectacular! In addition to the main event, both breweries will be competing with three additional brews each for a total of four brews per brewery. Stay tuned for more details!